a stroke from one edge to a similar edge with the free leg moved across the employed leg, above the knee, before the stroke. Free leg moves from stroked position along the line of travel, (off the surface) to beyond the employed leg. After stroking onto right edge, the free left leg is moved forward in a smooth deliberate way, with toe pointed as much as possible. This is a common sequence of steps used in a number of dances. 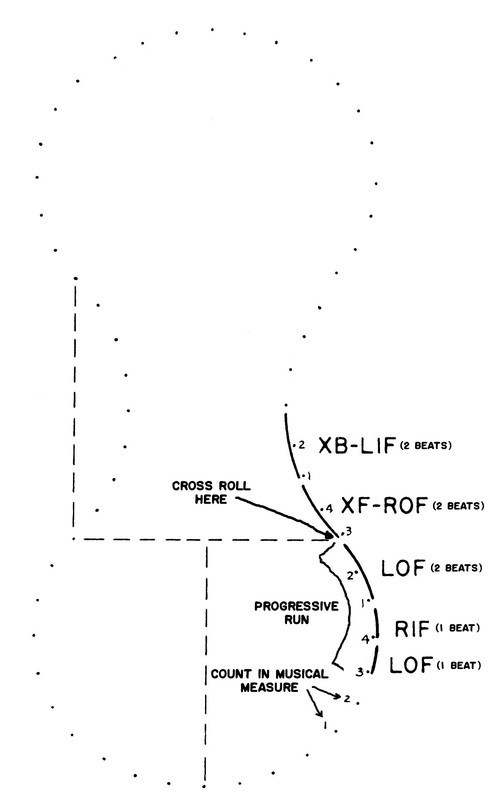 The dots indicate where on the floor a count relating to music starts, proceeding in a counter-clockwise direction, showing the pattern of the dance. In this example, there are 4 beats to a musical measure, and numbers show how the steps and music relate. The solid lines indicate how many beats an edge lasts. In dances where the lady and man skate different edges, the steps shown on the inside and outside of the pattern usually refer respectively to the man or the lady. The dashed lines indicate a 'baseline' on which 'lobes' of steps are placed. The dashed lines may also indicate the center of the pattern.